Love soup? Looking for the perfect winter comfort food? 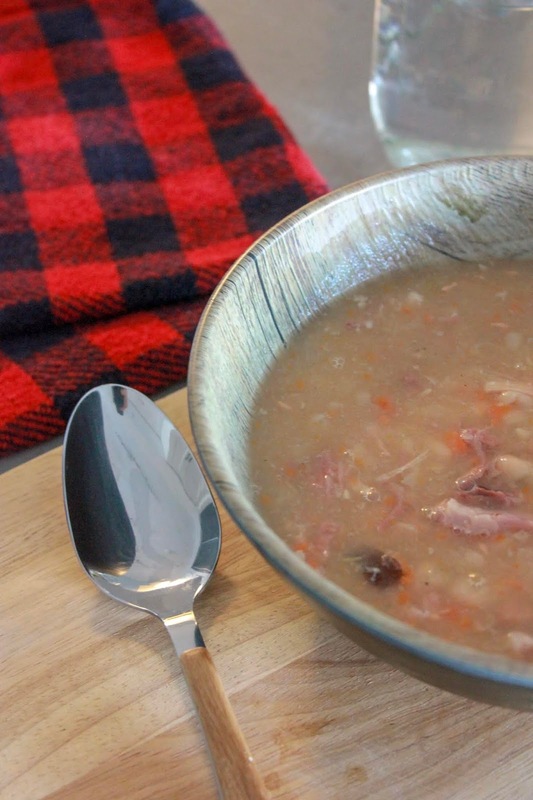 Check out Mama’s Slow Cooker Bean Soup Recipe. It’s sure to be a tummy pleaser! If you’re like me, you have a leftover ham bone in the freezer from Christmas. Or maybe even as far back as Thanksgiving. Either way, it’s taking up space and you need to get rid of it. Am I right? Or, if that’s not you, maybe you just love a good recipe for comfort food? Maybe some hot soup on a cold day? A reason to bust out the slow cooker or crock pot? Well, whether it’s reason a or reason b (or maybe even a combo of both), you’ve come to the right place. 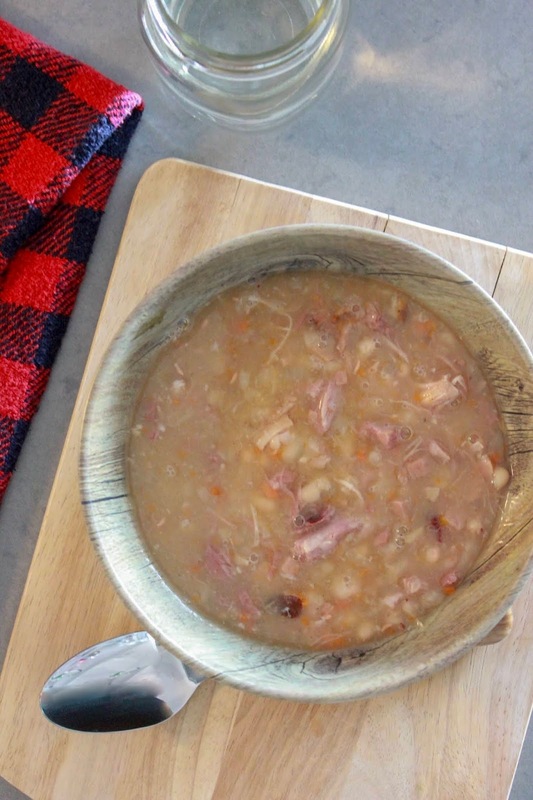 Today, I’m sharing Mama’s Bean Soup recipe. And yes, that mama is me. And my mama, because I can’t take all of the credit. She taught me how to make it. It's easy to make, it's tasty, it's hardy and it scream winter comfort food. It's also sure to be a tummy pleaser. Hey, if a "three-nager" devours an entire bowl, you know that's a fact. 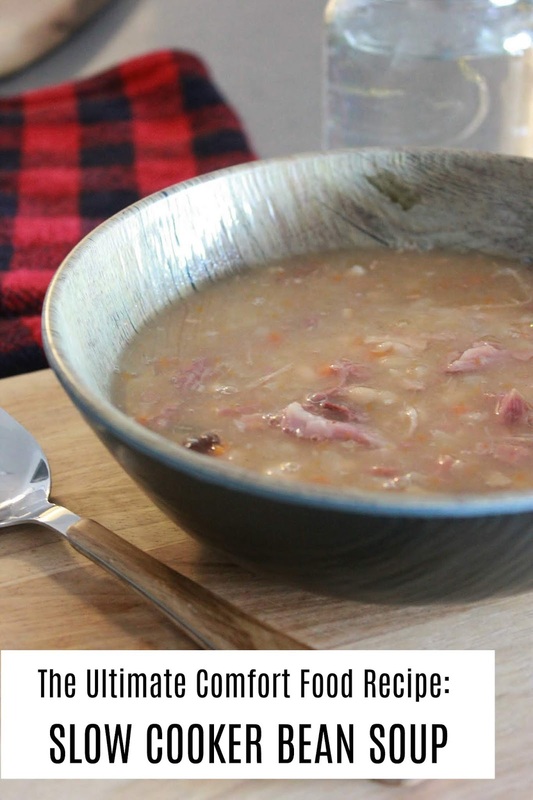 All you need is said leftover hambone (or a ham hock purchased from the store), some veggies, chicken stock and dried navy beans. Locate the slow cooker or crock pot from back of cupboard and dust off. Add onion, carrot, celery to bottom of the slow cooker. Place ham bone on top of vegetables. 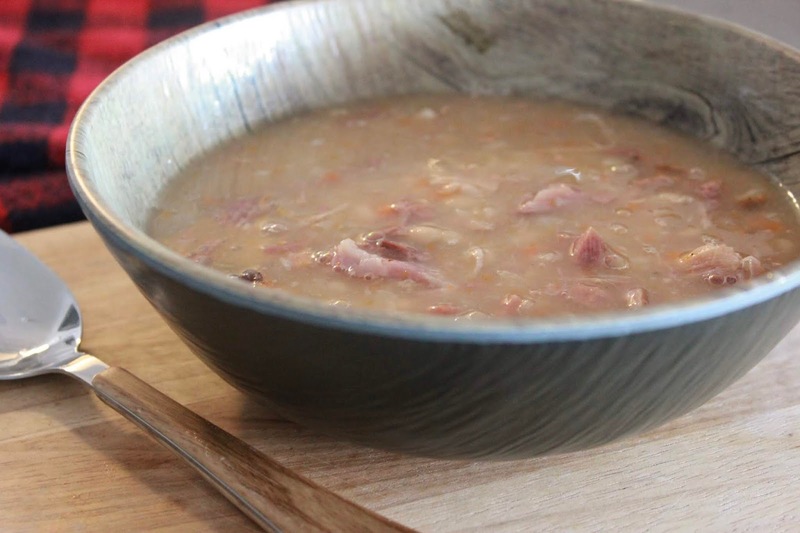 Pour dried beans around ham bone. Top with chicken stock and water, so that majority of bone is covered. Add water if needed. Set on high and cook for 6-8 hours, or until beans are tender and ham is falling off the bone. Remove leftover ham from the bone. Cut up and add to soup. Also cut up any large chunks of ham already in the soup. Can be stored in the fridge, covered for one week, or can be frozen for later. Note 1: I use half chicken stock and half water to make my broth, mostly to cut back on the sodium. The salt from the ham will help to flavour the broth. If you like a saltier broth, instead use chicken stock for the full 8 cups. Note 2: If you do not have a ham bone, you can purchase a ham hock from the meat department at your local grocery store. It will work just as well to flavour the broth, however, you may not get as much meat off the bone. If you enjoy soup, you may also want to check out these recipes for The Best Chicken Dumpling Soup and Fall Harvest Root Vegetable Soup. What is your favourite comfort food recipe? Do you enjoy soup? I’d love to hear!